Republic of Tunisia is a Muslim Arab country in North Africa with Islamic views that are much affected by its domestic socio-political condition. Since its independence, government policy tends to lean towards secularisation of Tunisia and marginalisation of religious roles. As such, the development of religious thoughts is leaning more towards Islamic religious movement. 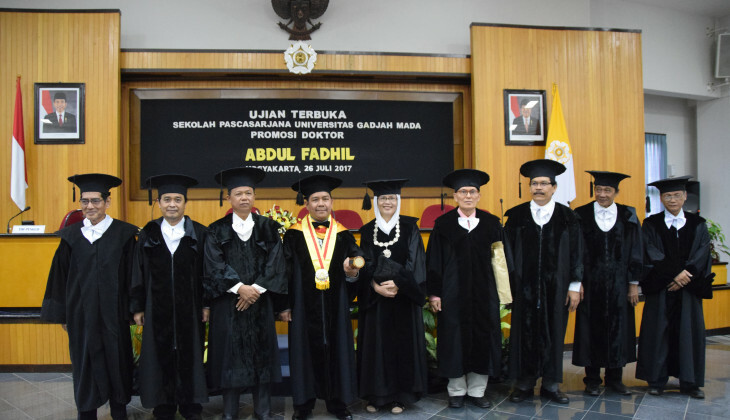 This was said by Abdul Fadhil, Islamic religion science lecturer from Universitas Negeri Jakarta, in his doctoral promotion from Religious and Cross-cultural Studies of UGM Graduate School on Wednesday (26/7). Studying the novel Ath-Thaliyâni by Syukrî Al-Mabkh that tells the figuration of ‘Abdun-Nâshir Ath-Thaliyâni and his supporters, Abdul described the change in religious behaviours of Tunisians in the novel. Apart from secularisation that is systematically adopted by Tunisian government, there has also been Marxist idea influence that grows freely influencing the young people. “There have been attempts shallowing religious values done by the government whether purposely or not, directly or indirectly,” he said. Control of political right of Islamic groups also affected such religious behaviour change of the Tunisian. This is exacerbated by the materialism and pragmatism development in religious life. The lack of political space to voice the aspiration of the Muslims and massive secularisation have made Tunisians apathetic in their religious and state affairs lives. Abdul added, religious behaviour change of Tunisian society revealed in the novel is categorised into three groups. First, religious behaviour change in normative religious teaching, for example not practising religious rituals, not praying for parents who have died, or the weak religious insight. Secondly, behaviour change in personality behaviour, such as drinking, gossiping, too much talking, laziness, lying, or slanderous. Third, behaviour change in family values such as harshly and impolitely educating children, disobeying parents, adultery, and sexual abuse of children.